Belize in Central America borders the Carribean, Mexico, and Guatemala. The population density is very low. The tourism industry is important, with cruise ships providing peak visits for which a fleet of coaches is present. Types present during a visit beginning of 2018 were secondhand ex US vehicles: MCI, Neoplan Metroliner, New Flyer Viking, and Van Hool, all three-axle models. These appear to belong to one company, most are in the same white-green-brown colour scheme and carry a fleet number in the 500-series. A few other typical tourist buses are also present: a trolley, little trains, a Dodge Ram with a roof…. The standard public transport bus is an old, secondhand, Blue Bird, mostly of the FE model. Several are shown here. A picture taken around 1980 (on the other buses page) shows a similar type of bus. Urban buses can be small modern 25-seaters of Mexican origin. 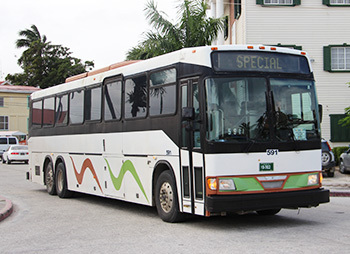 An excellent site for buses and general travel in Belize: https://belizebus.wordpress.com/ . It provides schedules and bus company names. Given the fact that most buses do not display a company name the presentation on this site is by bus model.